DUBAI // Visitors can spin in a gondola modelled on Thor’s hammer, wave to the Powerpuff girls in a colourful parade or get chased by ghouls and madmen when the world’s biggest indoor theme park opens in August. More than 20 rides and attractions at IMG Worlds of Adventure are in the final stages of testing and commissioning, with acrobats and dancers preparing for live performances since February. The park – spread over an area equivalent to 28 football fields and high as a 10-storey building – promises hair-raising experiences such as the Haunted Hotel, whose visitors must be 15 or older to “check in”. said Lennard Otto, chief executive of IMG Worlds of Adventure. Walking through the hotel, guests will negotiate a maze of winding corridors, tormented by ghouls and axe-yielding madmen. “As soon as you enter you’ll be running to escape,” Mr Otto said. Sixty-nine life-size dinosaurs lurk in the jungles of the Lost Valley, the dinosaur adventure zone. The plant-eating Barosaurus is the park’s biggest model at a towering 15.5 metres. It took the Japanese animatronic specialist company Kokoro five years to create the figure, which could look over a five-storey building if stood on hind legs. 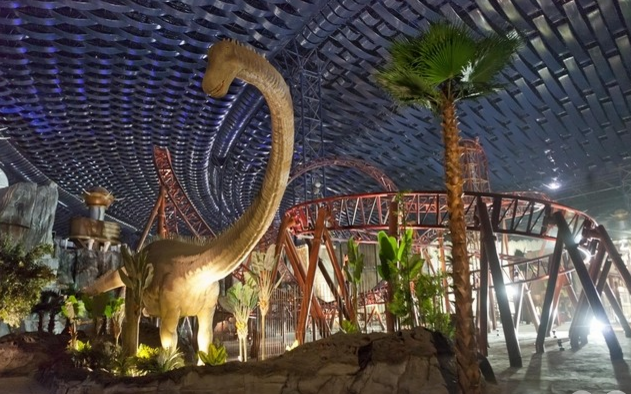 “To design each of the 69 dinosaurs that are within the park, Kokoro used hydraulics to replicate their unique movements,” Mr Otto said. Not for the faint-hearted, the Velociraptor ride begins in the park’s forest before propelling visitors outdoors for 2.5 seconds at 100 kph. Named after the quick, bird-like predator, the ride hinges on near-vertical drops and sheer speed. Markus Mack-Even, chief project officer, said his favourite attraction is the Ben 10 5-D cinema, which screens the story about a boy who uses a powerful watch to tap into his alien alter egos. The script has been produced exclusively for IMG Worlds of Adventure. “You are fully immersed into Ben 10’s world as the 5-D, multi-sensory adventure invites guests to battle evil and experience pulse-racing action,” Mr Mack-Even said. Daily parades, shows and meet-and-greets with Marvel superheroes can keep younger visitors entertained at the park, which will have events staged by about 80 dancers, acrobats and jugglers. In the Cartoon Network Zone, daily live performances will take place at the LazyTown theatre, with musical performances based on the children’s show. IMG said it received an overwhelming response of interest from the UAE and GCC as well as North Africa, Russia, China, Iran, India, Germany and the UK. It declined to disclose ticket sales but said it has estimated it will receive 4.5 million visitors in its first year. IMG Worlds of Adventure will open two months before Dubai Parks and Resorts, which will include three linked theme parks – the Hollywood-inspired Motiongate, Bollywood Parks Dubai and Legoland Dubai. “We are pioneering a whole new industry, building the way for Dubai to become a global leisure and entertainment destination set to rival Orlando, Florida,” Mr Otto said. Tickets are available for the August 15 launch at www.IMGworlds.com. They cost Dh300 for adults and Dh250 for children for a day. Children under 3 years old and 0.9m in height can enter for free. The park will be open from 10am to 10pm on weekdays and 10am to midnight on weekends.